It’s very compact as the battery fits into the stove compartment and then they both slide into the kettle. So tailgating is made easy for someone who doesn’t have the space or lives in a compact area like San Francisco. For us, it makes it easy to pack up or just store out of wa when not in use. 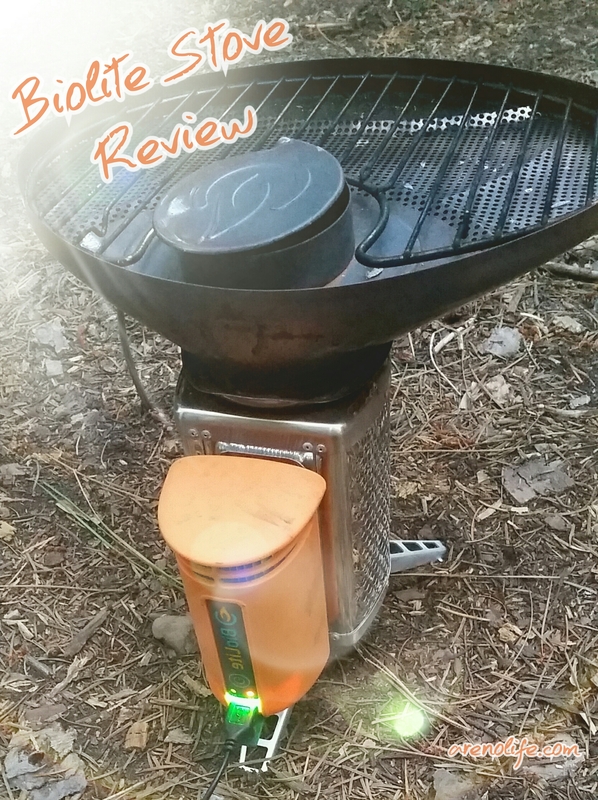 It is an all-in-one: a grill, battery recharger, and stove top. The battery and fan are self charging/propelling via kinetic energy from the fire, unlike the latest blue version out there. Small electronic devices like headlamps, and watches recharge quickly. Wood is free fuel. I have purchased the little Biolite wood pellets for when I just want to start a fire right away (yes i have been that lazy…I mean exhausted) or keep a fire going for a long time. I find the heat from the wood pellets is long lasting and more controlled, not mention I don’t have to keep throwing in twigs every 2 mins. I want to try BBQ wood chips to see if there is a big difference in flavors…..and I have seen them for cheap at stores. IF it rains…..say goodbye to breakfast, lunch and dinner. You need twigs/dry wood to start your fire and if you didn’t collect it before the downpour then you will be eating whatever doesn’t need to be cooked. Unable to sufficiently recharge larger devices like phones. My older Motorola smartphone recharged quite well with our Biolite; however, since I have upgraded to a Galaxy S5, a get a small burst of recharge (a whopping 1%) about every 5mins. I was reading that the newer phones will need more amps to recharge than older models. Just FYI. It is heavy for backpacking (33oz. = 2.06lbs) so I don’t recommend it for this activity. We use a Jetboil for backpacking and love it too but for different reasons. In the end, I would recommend the Biolite for tailgating, car/base camping, or is you need something really compact that does it all. But if you are focused on backpacking, not feeding a fire, instantaneous ON and just reheating water for your dehydrated meals, I really enjoy my Jetboil.